To state the obvious, the weather has been too good for fishing, but saying that, some good fish have been caught. The month started with a little competition about giving the lakes here at Avington a name, which sparked many of you to email us with your suggestions, some very good and some very funny. The winners will be revealed very soon, so keep your eyes on our facebook page. Talking about facebook pages, this will be the last monthly report from Avington, as all events and happenings along with pictures, will now be posted on facebook. Myself Roger Greentree, who is the front of house representive for Avington, also looks after the social media side of the fishery, i thought this was the best way to keep in contact with you the customer. Please let me have your thoughts on this change. On the 6th of August Antony Hill ( Famous for winning “Fish of the month” in Issue 511 of Trout Fisherman magazine, and also winning “Shot of the month” in issue 513 in the same magazine), and had a great day again with his mates. 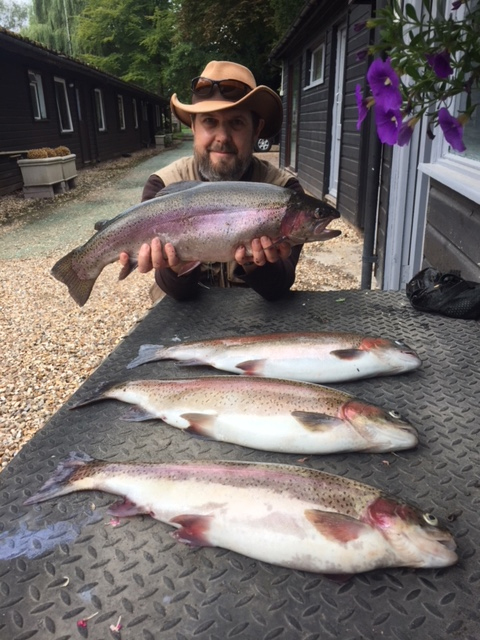 Chris Druce also visited us and bagged up with three fine fish, which also caused another debate concerning our facebook page, over whether we should show pictures of anglers holding fish to the camera, or, for pictures of the fishery. The outcome, from you our customers was for both, so thats what we are doing. The middle of the month saw the arrival of some old friends of Roger’s, two serving Gurkha soldiers from The Queens Own Gurkha Logistic Regiment, who both went home with two nice bags of fish. Charles Tonkinson on his first ever visit had a great day, with four very nice fish and his smiling face also added to our facebook page. He is taller than he looks in the picture, as he was kneeling down. Late on in August I heard someone shout “ What did you catch yours with “ and the reply came back “ Elerdine Enigma “. Well that was a new one on me, so I was straight onto the computer to find out. They are now in stock if you want to see one. To all you anglers who came to see us in August, during that hot spell, We thank you all. The team at Avington are looking forward to some cooler weather in September, so we hope we will see you again then. Copyright © 2019 Avington Trout Fishery. All rights reserved.